Brewers assistant GM Bruce Manno had an opening at AA El Paso in 1989 and he looked at Stockton hurler Steve Monson to fill it, according to David Lamb's book "Stolen Season." He thought Monson might get hit at El Paso, but he Manno ultimately decided to give Monson the shot, Lamb wrote. "He's damn tough mentally," Manno told Lamb later of Monson. "Sometimes you put a kid like that in this environment, let him sink or swim, and he'll rise to the occasion." Monson went up to El Paso and went 9-5, with a 5.68 ERA. He then returned to El Paso over the next two seasons, but he never made it higher. Monson's career began in 1983, taken by the Phillies in the 23rd round of the draft out of Chesapeake High School in Maryland. Monson is recorded as starting not as a pitcher, but as a catcher. He played 21 games at rookie Helena in 1983 and then 17 games in the rookie Gulf Coast League in 1984. Monson then isn't credited as playing in 1985 or 1986. He then returned with the Brewers as a pitcher in 1987. Monson went 10-1, with a 2.91 ERA at Helena, then 0-3, with a 6.32 ERA over 11 outings at single-A Beloit. 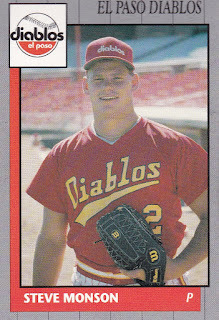 He moved to single-A Stockton for 1988. He went 14-4, with a 2.87 ERA. He picked up his seventh win in May against Reno. Monson played at Stockton and then El Paso in 1989. Overall, he went 12-7, with a 4.83 ERA. He picked up a 12-4 win in August. Back at El Paso in 1990, he started 20 games and ended with a 6.33 ERA. He picked up a win in April, giving up five hits over 6-plus innings against San Antonio, according to The El Paso Times. "I didn't start out too well, but about halfway through the game, I began getting my fastball in more effectively," Monson told The Times afterward. These (San Antonio) guys love the fastball, so it was fun to challenge them. Monson played 1991 between Stockton and El Paso. He went 10-6, with a 3.38 ERA between them to end his career.